I’ve been in a bit of a dilemma about even posting this recipe. I mean, there must a zillion recipes for chocolate chip cookies on the internet, and does the world really need another one? This recipe also originally comes from the back of a Cadbury milk chocolate chip packet, so it’s not like it has any kind of amazing star power behind it. I’m not even a chocolate chip cookie obsessive, tweaking dozens of recipes to bring you the ultimate chocolate chip cookie. (I’m actually somewhat philosophically against seeking perfection in my baked goods: it’s like falling down a rabbit hole into a quest for something that will be forever unattainable). 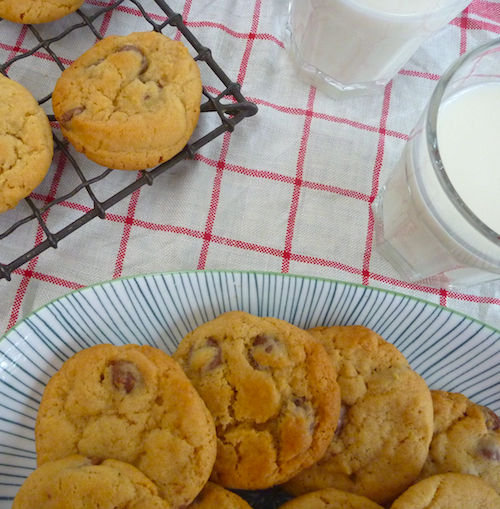 This is just a good, well-tested recipe for a classic chocolate chip cookie: it has a combination of castor sugar and brown sugar that all the best chocolate chip cookie recipes have but, other then that, there is nothing that sets it apart from a dozen other recipes. My excuse for posting this recipe is that whenever I make these cookies, people always ask me for the recipe and while I usually just kindly direct to them to the back of the Cadbury chocolate chip cookie packet, I do actually have a few tips that aren’t in the original recipe that will really make your chocolate chip cookies stand out from the crowd. Cream your butter and sugar really, really well. Although you have to take care not to over mix your dough when you are adding the flour and chocolate chips (this will result in a tough cookie), at the creaming butter and sugar stage, the more you mix, the better. Well-creamed butter and sugar gives you more air bubbles and makes for a lighter cookie, but it also means your butter and sugar won’t curdle when you add the egg. Chill your dough. Some bakers recommend chilling your dough from 24 up to 36 hours. I find this slightly excessive and find an overnight chilling an easier time frame to work with. If you can only chill your cookie dough for an hour or two, even that will make a difference. Chilling the dough allows all the dough ingredients to meld together and results in a more flavoursome, better caramelised cookie. 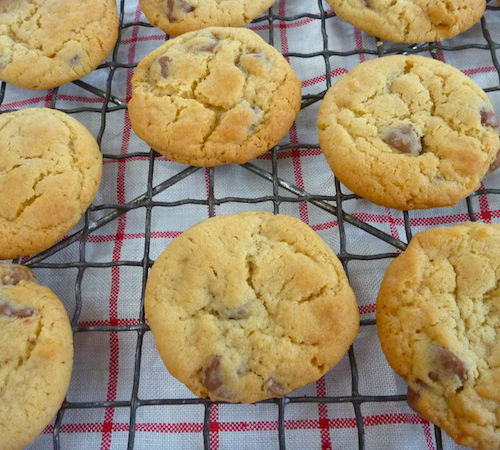 I like my cookies crisp but with a slight chewiness, so I roll the dough into balls and don’t flatten them out, resulting in the classic slightly wrinkled cookie top. Don’t forget the salt. People don’t love salted caramel everything for nothing: it’s the magical combination of salt and sugar that is addictive. The original recipe doesn’t have any salt so I’ve added quarter of a teaspoon. 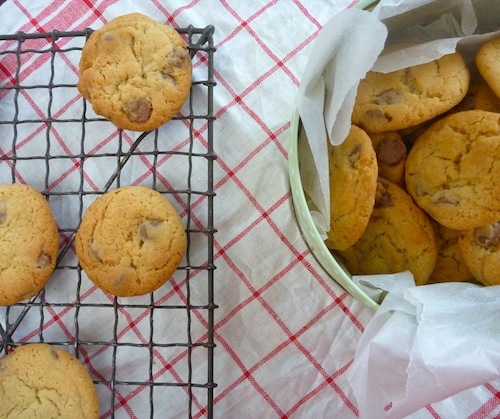 You can also replace the milk choc chips with dark chocolate, and sprinkle some Maldon salt flakes over each cookie just before baking – this will give a slightly more sophisticated adult chocolate chip cookie that kids will still love too. Cream butter and sugar until very light and fluffy. Whisk egg and vanilla into creamed butter. Stir flour through butter and egg mix then add chocolate chips. Chill dough at least for an hour. Preheat oven to 160°C. Cover baking sheets with baking paper. Roll dough into balls (about 1 tablespoon each) and arrange on baking on sheets. Bake in moderately slow oven (160°C) for 10 to 15 minutes. Rest cookies on trays for a few minutes, transfer to wire rack and cool completely. This is my go to cookie recipie and like you I always get asked for the recipie. Will definitely try your tips though to see I get an even better cookie! Yes it is amazing how people love these cookies. I originally asked for the recipe and was directed to the back of the packet. It is a really good basic recipe that you can add to and adapt. Great tips Elizabeth. I must try chilling the dough. I confess I’m too eager for the end result to have given that a whirl before now but it seems greatness is worth waiting for. I don’t always have time to chill the dough but when you’re making these cookies in the middle of summer it’s really a necessity.